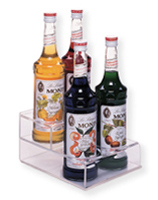 Multiple tiers allows you to store many items on one display without occupying too much space. Clear acrylic construction makes it easy for customers to view the items contained. Clear acrylic is durable and very easy to clean. It also helps to not distract customers from the items on display. Designed to fit into bakery cases. This is a salt and pepper table caddy. It also comes with a sign holder to display relevent information to your customers. Durable construction for high traffic areas. Clear acrylic construction is highly durable and easy to clean. It also allows your customer to easily view items from all angles. There are 4 spaces for holding different bottles. 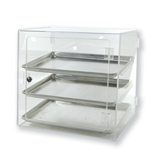 This cake display case has a slanted tempered safety glass front and fourlevels to display your baked goods on. There is a food safe light in the customer side extrusion that will light your treats up. There is also open storage in the base of this cake display case. This candy display case is built in a prism design and has a climate control option if your treats need to stay cool. The storage area is also climate controlled if you get that option. The interior deck of this case is high pressure laminate which is very durable and ideal for food service applications. The doors of this candy display case are mirrored and will reflect all of your treats to your customer. Clear acylic construction is highly durable and creates a clean professional look. 4 compartments make it easier to organize items. Helps keep lids consolidated and easy to access. This is a half pan, clear pastry display case for standard bakery trays. Clear acrylic construction is highly durable and it creates a clean and professionial look. 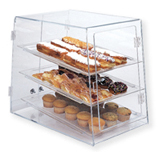 This is a clear, tabletop, self serve, 3 tier, pastry display case. It also has a double entry making this item extremely easy to access from the front or from behind.